DreamSoft's Core competency is and will be in Analysis, Development Cycle & Implementation for various Web Based and Desktop Based Software Solutions in various fields. But after mastering the art of the Software Project Cycle, we have been able to guide the clients with the complete design of the Automation Process. After understanding the clients requirement, we can guide them which Automation Devices like PLC's, OPC Servers etc. will be or won't be required and what should be the flow of the logic for the same, integration of protocols with Devices and Equipments is one thing but getting specialized into which PLC or Logic Controller should be used is something which requires overall System Design Expertise.We have guided many clients with right advice and with practicality for their Device / Equipment / Automation Projects implementation. We have taken up many projects in which design consultants have used wrong methodology / concept and we have entered in that situation and changed the logic and have given successful implementation. Now with our experience, we can even help client in outsourcing right hardware vendor for Automation Devices and Equipments. Many times, as a Software Developer, its not our role to get into the consultancy of Hardware Design or suggesting some Hardware to client, but if we feel that better solution can be derived after changing the system, we do suggest our ideas to client. This is the reason, our clients don't want to leave us and want to use our expertise in various domains. We work as third party vendor too in many project implementations. We work seamlessly with the other teams working on the same project and integrate our solutions with them. 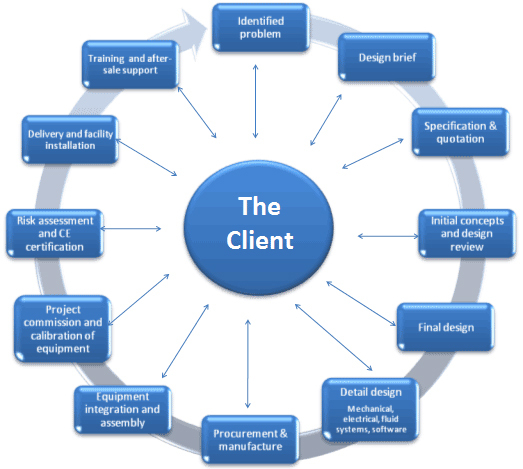 Please do let us know if you need any consultation for End to End Project requirements too.